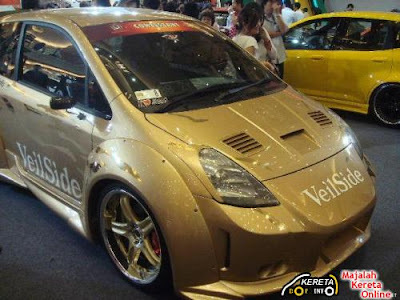 Well, is the jazz above extreme enough with body kits of Nissan Fairlady 350z veilside? 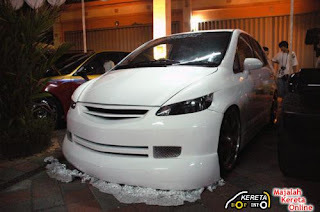 This is what we call making up your beloved cars > “Pimping your own ride!” For me, white is a very sporty colour and the owner of this honda jazz really make a good job on his ride. 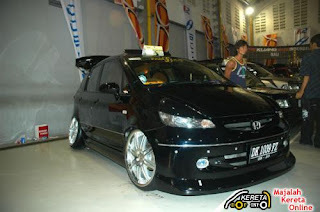 Smart and clean design white colour jazz bodykit with extreme lowered bumper in front of the powerfull vtec engine. OMG! Look at the rear tyre! Tilted extremely outside. The function of tilted tyres is to give better grip and balancing especially for drifting cars. This "Honda Civic" Jazz. Nice looking. A total of 300 visitors per day is awesome.I never reach it before. Hi Peter, really nice to know you.. ;) thank you for dropping by at my blog..art has no limit ya..you, with cars..me, with daily life stories..I really don't know about cars and so forth (technically)..I am just in a level of amazement..haha..
Love the body kits! Add some spinners and your away.